Labelled by Q magazine as folkies who add an indie scuff to the genre, we check out the first release from Kat Gilmore and Jamie Roberts since 2016’s In Our History that marked a decade of performing together. Recently I’ve had a thing about first impressions. To the extent of having an earworm of the song by who else but The Impressions; a seventies soul number that goes “first impressions are lasting impression, I know, I know”…etc…etc. 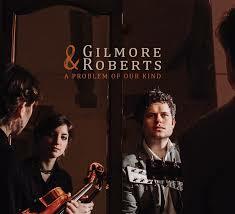 But back to the plot – yes, indie folk and up first to prove the point is Gauntlet, a track in Lakeman/Zep/Fairport territory and one that suggests that the claim of a more stripped back and rootsy (organic even) version of Gilmore & Roberts may be justified. But hang on, bringing the duo’s visions to fruition is Ben Savage’s co-production; one that guarantees a sympathetic ear for the tender and delicate arrangements that soon kick in and at times aren’t too far removed from some of his stunning work with Hannah Sanders. Musical friends include drummer Fred Claridge and Matt Downer on double bass whose familiarity also guarantees that they’re congenial and subtle contributors when added octane is required. It’s that very Savage hand though that guides much of the fragility with On The Line (notable for its gentle guitar lines emerging straight form the bluesy unaccompanied Bone Cupboard) and The Philanthropist while at the same time allowing the full band to work up not quite a head of steam, but certainly enhancing the arrangement on The Smile & The Fury and if you can’t avoid thinking of the Dodgeball film, Average Joe which has a real organic rootsy hoedown vibe about it. Lyrically, the songs fall within the positive and negative aspects of human nature – selfishness and materialism clashes with sentiment and generosity but returning to where we began, A Problem… doesn’t quite carry the same sort of indie scuff or sheer brazen punk attitude that, say, Lankum or Stick In The Wheel bring to the folk table, so Q magazine may need to broaden their folk pallette. However, it is an album that combines the electric buzz of band driven folk music and some quality in the sensitive and refined songwriting. The G&R website is here.